Naama Millennium Preparatory School is located in the village of Naama, Mityana District in Uganda (East Africa). It is about six kilometers out of Mityana Town. It is a private elementary school educating children ages 5 to 18, many of whom are orphans. It was established in 2000 and opened in 2001, starting with 77 pupils spread in five classes (nursery to primary five) and attended by a team of four very committed teachers. Classes were held in one commercial building remodeled to provide the instructional rooms. In ten years the school has grown significantly. For eight years it has had pupils sitting for P-7 national examinations and preforming very well compared to other schools in the district. As of June 2011, the pupil population is more than 480 of who one third are orphans. The teaching staff has grown to 11, acquired more land, built more classrooms and developed a play ground for the children. This year 2011, two of the first group to sit their PLE are joining the University, another two are joining the National Teachers College (NTC)and one who went to a local teachers training college (TTC) has completed a teacher training certificate. At Naama Millennium School pupils are taught facts and figures, provided with nutritious food, provided with shelter if needed and those who are sick are assisted with appropriate healthcare. Due to the high orphan population pupils are offered life skills training commensurate with individual’s age and class. Naama Millennium School provides a chance for longer and better lives for all its pupils and their families. It has provides hope where it never exisited. Pupils can confidently state what they want to be when they grow up which is an indication of their rejuvinated hope. Physical Education (PE) is an integral part of the daily activities of the school. 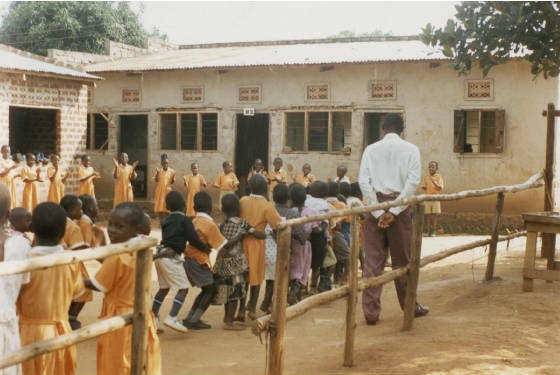 Here is a group of pupils playing tag under supervision of a teacher. Others are actively cheering and enjoying a sign of involvement for everybody! This is essential for the brain to take a break. School Year runs from late January through early December and instruction follow the approved national curriculum. The year's instruction id administered in three terms of about 60 school days each (weekends excluded).